Celebrate your love with a romantic gesture. A kiss. A glance. Or our Sweet Romance seating chart. This seating chart features a sweeping pink floral pattern, complete with your initials encircled within the elegant curls and scrolls. The soft pink color bodes well for spring weddings or Valentine's Day events. Personalize your message and font for a one of a kind touch. 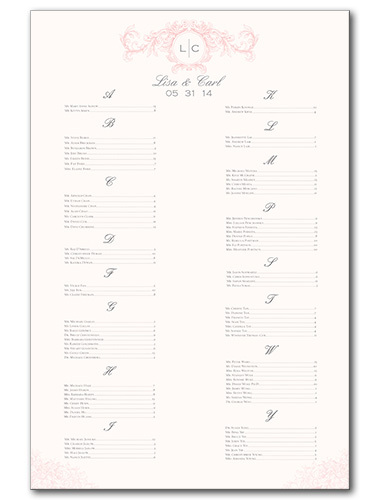 Sweet Romance Seating Chart For the best experience, we recommend personalizing your stationery on a desktop computer.